In a word – fantastic. It is difficult to believe that this book was written in 1820. The novel is quite mad and surreal in a Bulgakov way: in fact there are many similar elements – a cat with human qualities and ‘the master’ who seems to control everything. Once you get used to the language Murr is more laugh-out-loud than the Master and the Margarita. There are no weak patches in the novel and it’s structure things are perfectly paced. I thought I might struggle to read it, particularly on a beach holiday, but once you adjust to reading the two narratives as fragments there is no problem. 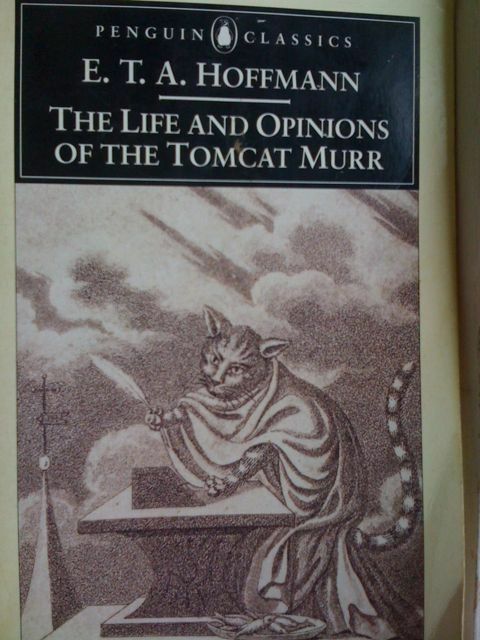 The musings of the cat are written on the back of a fictional biography of a musician named Kapelmeister. The cat has apparently ripped up the pages in a fit of piqué and so an episode breaks off and the other starts leaving much to the imagination. I have now realised that much of 20th century fiction was doing something begun 200 years before. This is possibly the best book I have read all year and I will now be reading everything I can find of Hoffman. One anecdote I heard was that Hoffman was an administrator for a time in Prussian Poland and was responsible for making sure all the population had surnames. Jewish and gypsy people would wait to be given names by him hoping that they would be receive something normal. If Hoffman had good fish for lunch then in the afternoon all the names would be fishy. Similarly, if dinner had been with a general then the names would be patriotic and martial. Apparently you wouldn’t want to get him with a hangover. This is as strange and absurd as the episodes in his stories. There will more Hoffman reviewed here very shortly. This entry was tagged Hoffman; E T A. Bookmark the permalink.